Ecclesia Semper Reformanda: Repent. And believe in the Gospel. According to St. Mark, the Lord Jesus began his public ministry with this clarion call to conversion, and here we find the pattern of all authentic reformation: Repent, and believe in the Gospel. This summons of the Lord Jesus finally reached my ears when I was 19 years old, and as I begin a continuing discussion of ecclesial renewal, it seems fitting to describe briefly the beginning of my own conversion. I was born in 1962 to a Protestant family in the small mountain town of Elkin, North Carolina. My father was a Southern Baptist, and my mother belonged to the Church of the Brethren, an Anabaptist movement begun in the 18th century by Alexander Mack. Because the churches of both of my parents practice only a baptism of believers, I was not baptized in infancy. In 1964, my family moved from Elkin to the city of High Point in the Piedmont Triad of North Carolina, and there I lived until I left home for college in 1980. My maternal grandfather and his extended family were founding members of a small Brethren church high in the mountains of northwestern North Carolina, and my mother attended a college of the Brethren Church in the Shanadoah Valley of Virginia. Although we did not regularly attend church during my childhood, I do remember worshipping with family and friends in Brethren, Baptist, Methodist, Presbyterian, and Episcopal churches, but I grew increasingly suspicious that Christianity was not a true account of the world and of my place in it. From earliest years, I was fascinated by the natural sciences and eagerly read popular books and magazines about astronomy and physics. I was an able student and a natural raconteur, and this combination made me increasingly arrogant as a young adolescent. I began to hold in disdain my native culture and to dream of leaving behind the superstitions of (to borrow Flannery O’Connor’s fine phrase) the Christ-haunted South. In the summer of 1976, when I was thirteen years old, I attended a residential junior high school program run by the State of North Carolina at a camp near one of the state universities. This two-week program for advanced students was designed to introduce us to a level of academic work not possible in the government schools, and professors from the state university system would give us lectures about their own disciplines. On the first day of the program, a philosophy professor spoke about the philosophy of religion. She announced at the beginning of her lecture that she was an atheist and then explained the nature of the truth claims of atheism. As she spoke to us on that flawless June morning, I understood in an instant what I long suspected: Of course there is no God! He is merely a phantom of human imagination conjured up to calm the nerves of pre-scientific man. From that moment, at about 11 am on 14 June 1976, I was a convinced atheist. During my high school years, I learned as much as I could about the natural sciences and the philosophy of scientific materialism. I sought to understand the cosmos and everything in it by the light of natural reason and empirically verifiable explanations of all phenomena, which are–I then believed–reducible to measurable quantities of matter and energy. At the same time, I delighted in being the Village Atheist and went out of my way to taunt the Christians among my peers. In the summer of 1979, I attended another residential summer program, the Governor’s School of North Carolina, and there I joined the battle with Christians in what came to be known in school lore as “God Wars.” I took special delight in confounding the faith of my Christian classmates who believed quite sincerely but were ill prepared to defend their beliefs with reasoned argument. In 1980 I fled the South like a burning building and matriculated at Princeton University. In the Fall Semester I enrolled in a course entitled “Christianity and Its Critics,” and my intention was to find ever more creative ways to expose Christian beliefs as absurd superstitions. Instead, I was exposed for the first time in my life to the writings of powerful Christian minds, and I discovered that the ideas of Augustine, Aquinas, and many others were compelling. During that year I also became friends with other undergraduates who were devout, orthodox Christians, a development which took me by surprise. In order to reach the Princeton library, one must pass in front of the University Chapel, a magnificent Gothic church designed by the famed architect Ralph Adams Cram. 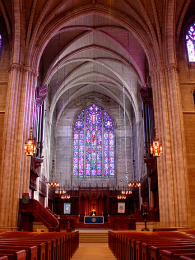 During the winter of my freshman year, I found myself going into the building to admire the sublime beauty of the windows, the stone arches, and the wood. One evening in the spring of 1981, as I sat alone in the roaring silence of the empty chapel, I said to myself, “I know You’re not here.” And in the instant of the thought I was aware of the paradox: If He isn't there, then to whom are you speaking? This was the first crack in the ironclad certitude of my atheism, and many others were to follow. In the summer of 1981, one of the men who lived in my freshmen dorm died at age 19 of a sudden heart attack. His death forced me to confront the reality of my own mortality, and in that moment, two of my friends saw an opportunity to bear witness to me about their faith in Christ. Throughout the fall of 1981, they spoke regularly to me about the Lord Jesus and encouraged me to read the Bible. In early October I began to read St. Paul's Letter to the Ephesians, and on the evening of 15 October 1981, one of my friends came to my room after supper to talk about St. Paul's glorious description of the eternal plan of salvation in the opening verses of Ephesians. I told him that I wanted to believe that Jesus of Nazareth is the Son of God but that I did not know how. He asked me to kneel with him on the floor, and he began to pray. In a moment, my entire being was filled with fire -- a purifying, illuminating, transforming fire. I do not know if we prayed for twenty minutes or two hours, but I do know this: When I rose from my knees, I had an absolutely certain knowledge of the truth of the Gospel which has never left me. Jesus Christ laid hold of my life that night, and despite the length of years and the darkness of my sins, the memory of that experience remains undimmed. My first question was, What’s next? I began to ask about Baptism and was confronted with the problem of many churches. Why aren’t Presbyterians Lutherans? And why aren’t Baptists Anglicans? And why is it that they only thing on which they all agree is that they aren’t Catholics? The classmate whose death had precipitated my conversion was an Episcopalian, and the Episcopal chaplain invited his friends to share in a memorial service. That experience of reverence and awe in liturgical prayer drew me powerfully, and so I was baptized in the Episcopal Church on 17 January 1982. Even before my Baptism, however, I was filled with questions about the Church. My Catholic friends at the university began to suggest books to read, and with their help I discovered the Fathers of the Church, Cardinal Newman, and G.K. Chesterton. I spent six months reading and praying and only then asked a friend to introduce me to a priest. I was a 19-year-old student and a new convert to Christ, and I had never met a Catholic priest. In July 1982 I was introduced to Father Peter Stravinskas, who was then living in nearby Trenton, New Jersey. He gave me a copy of Father John Hardon’s catechism, and we met once or twice each week through the summer and fall as he instructed me in the Faith. 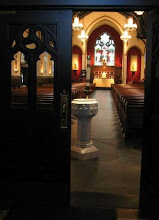 At last, on Friday 5 November 1982 (the same day on which my mother's father died) I made my first Confession, was received into full communion with the Catholic Church by a profession of faith, received the Sacrament of Confirmation, and then received Holy Communion for the first time in the Catholic Church. I was three months past my 20th birthday, and everything in my life had been turned upside down. What could possibly come next?